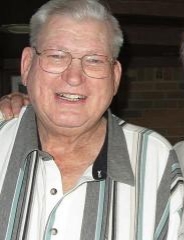 James Howard Lee, 86, went to be with the Lord on November 27, 2018 in Fort Worth, Texas. He was born to Grace Ballard and William Andrew Lee on November 20, 1932 in Fort Worth, Texas. James served in the Army Air Force. He married Patricia Jean Hurley June 14, 1957 in Fort Worth, Texas. James loved to hunt and fish. He worked many years for Lennox Heating and Air Conditioning and late for Trane before he retired. In his last few years he enjoyed running his hay farm. James is preceded in death by his parents, William Andrew and Grace Lee. Those left to cherish his memory are his wife of 61 years, Patricia Lee; his son, Steven Forrest Lee; his daughter, Katherine Ann Tindell; his grandchildren, Brian David Tindell; and his great grandchildren, Jamison Nicole Hughes and Hayden Hughes Jr.